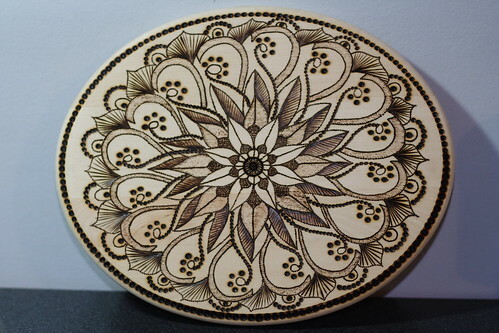 It turns out you can make mandala on ellipse wooden plaque! I was looking at the piece of wood and I was wondering, what can I do with it...what can I do with it...and then it dawned on me! 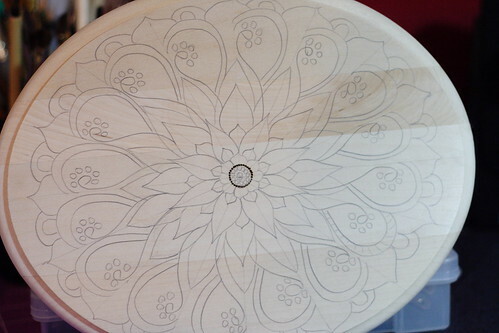 It doesn't matter it's ellipse, I can still make a mandala out of it! So I started with a simple sketch as with all of my pyrographed pieces. If you are interested how I prepare the wood and do the sketches, I have explained the process here. It's like the mandalas are born, not made! 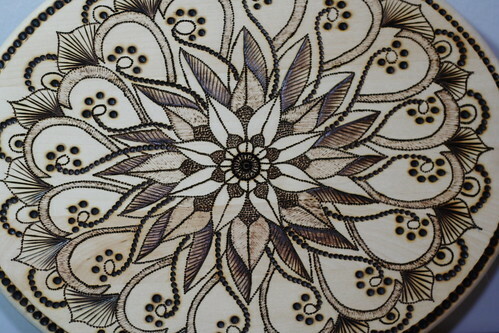 If you want to take a closer look, click on the pictures and you'll see the Flickr version of the pictures enlarged and if you liked this mandala, you might like to see the mandala plate I made a couple of days ago. Ани, направо съм влюбена в твоите мандала (не знам правилно ли използвам множественото число). Радвам се, че ти харесват! Мисля скоро да пусна и тези, които рисувах с бяло мастило в/у черна хартия. Имам още една чиния да пусна ( тя е огромна направо! )с мандала и после ще пусна тези на черна хартия. От тях мислех да правя печати. The pattern and detailed art work is simply amazing.The pattern within a pattern gives it an interesting 3d look. Thank you, Brenda! I'm glad you like it!